Astha Rajvanshi was there as it happened. Violent confrontations between police and students erupted at St John’s College as Federal Education Minister Christopher Pyne entered the premises to adjudicate the John Howard Debating Cup. About 50 students gathered near the main entrance of the college on Missenden Road, Camperdown to protest against the Federal government’s proposed cuts to higher education. University of Sydney Union Vice President Tom Raue said the protest was “organised by student activists over the last couple of days in secret, as we didn’t want the Liberals to know”. “The main message of the protest was that these attacks are not welcome by students. Liberal politicians are not welcome on the campus that they are destroying,” Raue said. The event was hosted by the Sydney University Liberal Club with Attorney-General George Brandis and Liberal MP Peter Phelps also in attendance. 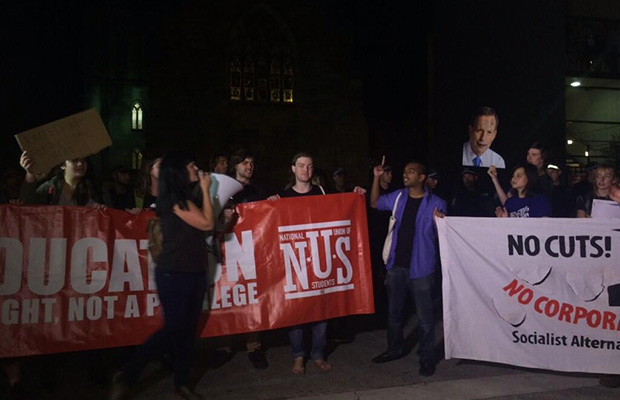 Over 50 police officers from the NSW Public Order and Riot Squad were present, outnumbering the protestors, and blocked off all entrances to the college as protestors attempted to gain entry. Pyne’s car arrived at approximately 6:30pm through the Missenden Road entry and drove into the underground car park within the college, at which point a forceful confrontation saw a number of students being pushed and shoved to the ground by the police. SRC General Secretary Mariana Podestá-Diverio described being subjected to police brutality: “One riot policeman punched me in the breast, and another pushed me onto a fallen chair and into a sandstone wall. I was thrown to the ground by riot squad cops twice. My glasses were knocked off my face by one officer who shoved another protester in front of me”. Footage from the scene appears to show a police officer punching a student, and tweets covering the incident report several students being assaulted by riot police. “I heard several of the riot police talk about how violent they’d been … one of them joked about how he punched a woman in the face,” said Raue. An argument between police and protestors took place later in the evening. “We’re going to be seeing a lot of each other and if you’re not civil it’s going to get very messy,” a police officer was overheard saying to a student. The event concluded around 9:30pm, with protestors and police dispersing from the premises. “A few people are a bit shaken up, but overall it was a success because it has gotten a lot of media attention,” said Raue. Twitter coverage by Georgia Behrens, Felix Donovan, John Gooding, Georgia Kriz, and Astha Rajvanshi.